Our Warwick Pest Control Exterminator will identify the source of the pest infestation & create a customized treatment plan to eliminate the pests. 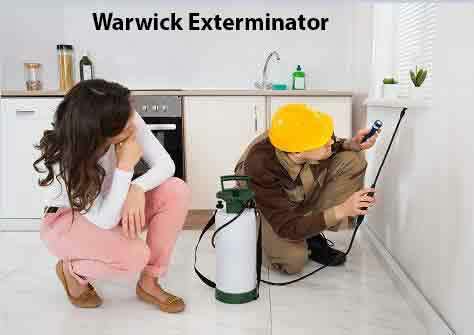 Let us be your Warwick Exterminator, Give Us A Call Today. 1-844-305-8999. Yellow Jacket Wasps are Common to Warwick New York, Long Island, Westchester County NY and Rockland County NY. Yellow Jacket Wasps are very aggressive and have black and yellow, banded markings on their abdomen with a very vicious stinger at the end. Yellow jackets are representative of social wasps that live in large cooperative groups that will defend their colony at all costs. These wasps’ nest in the ground, lower branches of shrubs, hollow logs, stumps or wall voids of your Home or property. You should never try to remove a Wasp Nest by yourself. Our Warwick Exterminator specializes in removing all types of Stinging Insects from your home and property. We have the know-how, Give Warwick Pest Control A Call Today. The two most common hornets you will find in Warwick NY, Orange County NY, and Rockland County NY are the Bald Face Hornet and the European Hornet. The European or giant hornet is an introduced species first reported in the United States in 1840 in New York. European hornet colonies often contain 300 or more workers by September or October (maximum of 800–1,000 workers). Hornets are frequently encountered near homes, barns, and other buildings or structures on your property. If you notice Hornets or any other kind of Stinging Insects on your property, Give Us A Call Today. Our Warwick Exterminator will remove the Stinging Insects from your property fast and efficiently. Social Bees nest in colonies and defend their nest and or hive. Solitary bees build individual nests, hives and are generally non-aggressive. A Bumble Bee is the common name for any bee in a group of large hairy, mostly black and yellow social bees. Sometimes, the hive is hidden in wall voids found in the structure on your property. An inspection to the interior of the building is required to identify any potential openings that can be used by bees or any other Stinging Insects entry point. At Dependable Exterminating we specialize in the removal of all Stinging Insects Hives or Nest from your property.